36" Industrial Strength Electrohydraulic Quad Scissor Lift Tables (120"W max) are high-capacity extra heavy duty electrohydraulic scissor lifts. 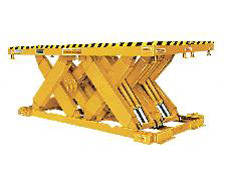 They are designed for extremely heavy-duty lifting, from their structural strength to their high-power lifting ability. Axles and shafts are stressproof shafting, hard chrome plated and polished, retained with a positive locking screw ring system and equipped with lifetime PTFE lind, composite bearings. All controller components are UL and/or CSA approved. Specs: See table below. *Externally-mounted power unit with 10HP 230/460V, 3PH, 60Hz continuous duty TEFC motor. Specify required voltage.